Interview with Real Life Legend, the Founder of Animal Communication: Penelope Smith! Penelope Smith is one of the most amazing women I’ve ever met! It took me 8 months to make this extraordinary Rare Event happen, but now you can listen and learn from her too! * The History of animal communication — which Penelope wrote the books on! * What about animal reincarnation? * What are nature spirits and how can we work with them? * and many more topics and answers to participants important questions! Penelope knows how to hear them, understand them, communicate with them so they share their innermost thoughts. And she has taught thousands of people the world over to do the same! Did you know that Animal Communication is now practiced by MILLIONS of people the world over? Penelope Smith wrote the book(s) that deepened Human-Animal Kinship around the world and made this happen! We are sorry you weren’t able to be with us in person so you could have asked Penelope your most important questions about animals and animal talk. But you CAN listen and learn as she answered our many listeners’ questions, took us through meditative communication exercises, and we discussed a lot of topics in an hour and 40 minutes! Penelope is THE Founding Pioneer and Animal Communication Specialist, author of “Animal Talk” and “When Animals Speak”, editor of Species Link magazine. Penelope doesn’t do many media appearances anymore which makes this a very RARE, historic event! What a tremendous opportunity to learn from the Master Teacher herself! If you have never experienced Penelope before, or have only read her books — let me tell you. There is nothing like being with her in person. Be sure and tell your animal loving friends too, they’ll want to get in on the fun. This Interview is ONLY available as a Bonus in her Introducing Animal Communication Home Study Course. 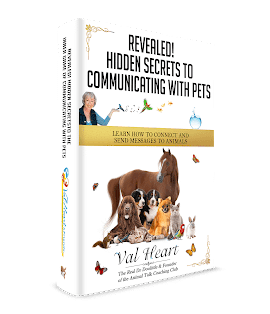 Click Here to Get Started Learning Animal Communication and to Find Out How You Can Access Val’s Interview with Penelope Smith. Val has many of Penelope’s wonderful books listed on the Val Heart Recommends page, including Animal Talk, which is the prerequisite for my Basic Workshop course on Learning How To T alk With Animals: Click here to order Penelope’s books.